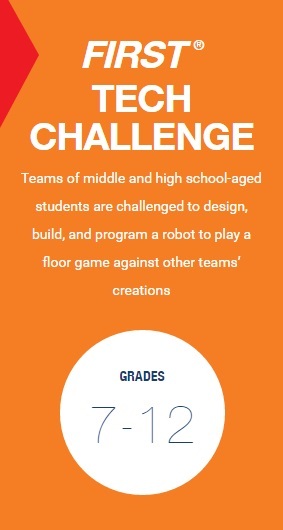 FIRST Tech Challenge is designed for middle- and high-school age students who want to compete head to head using a sports model. Teams of 3 to 15 students — based at schools, after-school programs, or in community groups — are responsible for designing, building, and programming their robots to compete on a 12 X 12’ field in an Alliance format against and with other teams. Robots are built using a TETRIX® or MATRIX® kit of parts that is reusable from year-to-year, using a Java-based Android programming platform. Teams, including Coaches, Mentors, and Volunteers, develop strategy and build robots based on sound engineering principles. Awards are given for the competition as well as community outreach, design, and other real-world accomplishments. The season begins with a September kickoff, and competition in most Regions runs December through February. Teams compete in local regions in either League or Qualifying Tournament formats, leading to Regional Championships in February. Top regional teams advance to the West Super-Regional in March, and top West teams advance to the World Championship in April. Create a team with your friends or at your school! Register and find out more at http://www.firstinspires.org/robotics/ftc. You also can find events in your area at http://www.firstinspires.org/team-event-search. Design, build, and program robots. Apply real-world math and science concepts. Develop problem-solving, organizational, and team-building skills. Compete and cooperate in alliances at tournaments. Earn a place in the West Super-Regional and World Championship. Qualify for nearly $30 million in college scholarships.